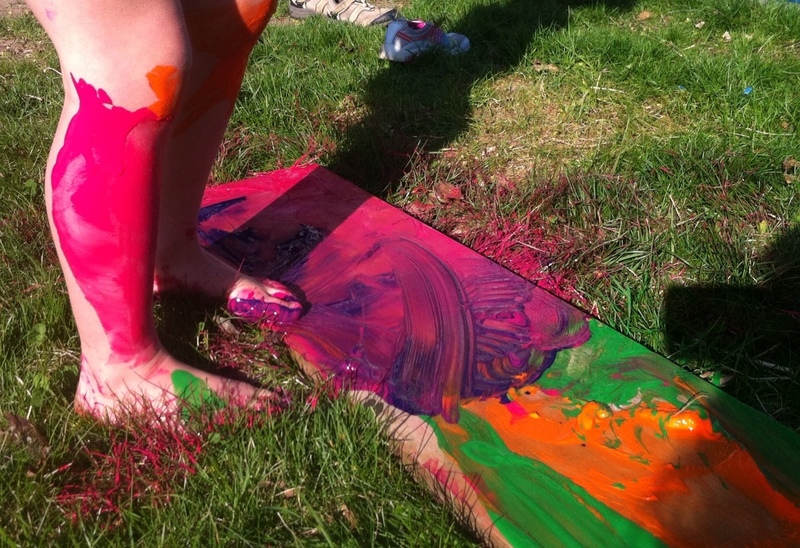 My daughter at play: Art or slip-n-slide, or both? It was a sunny winter day the first time I saw Lilyana swimming free under the water. The small pool at our Y has south-facing windows that let in afternoon sun and rays shine through the glass and white-blue concrete of the pool. 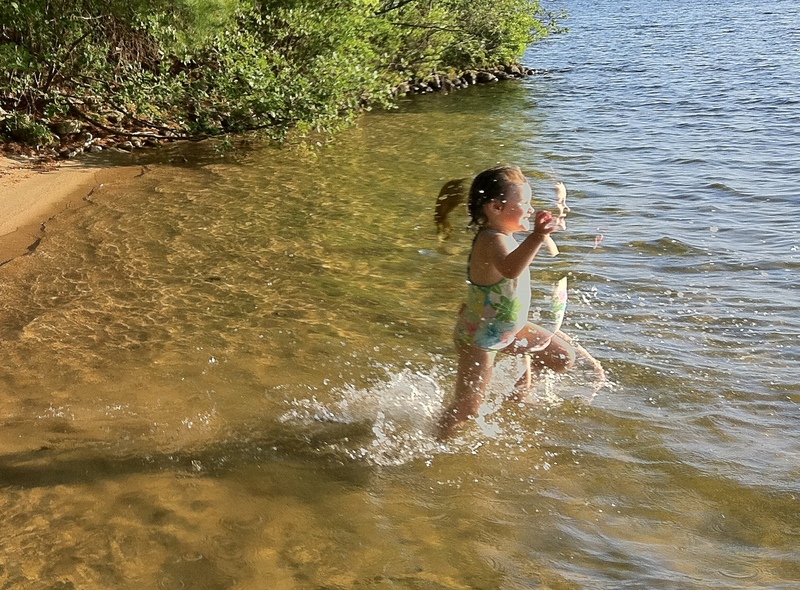 I’d finally remembered to put on the swim goggles we’d bought months ago, and sticking my head under I watched as she wriggled and kicked as she figured out how to make her four year old body move downwards in a predictable way. English has no word for the instantaneous combination of joy, delight, caring, watchfulness for threats real (water up the nose) and imagined, seeing backwards in time to all our earlier water experiences, looking forward to summers at the lake, going further back to my memories of growing up in the water, pride for all she can do, hopes that this learning and growing and play will go on and on through our lives, and awe. So much awe and gratitude that I get to be so lucky as to share this moment. Then she comes up, and I can already feel the Duchenne crinkles around my eyes and a massive grin on my face, and our eyes meet and she’s grinning too and we’re both glowing with this new. 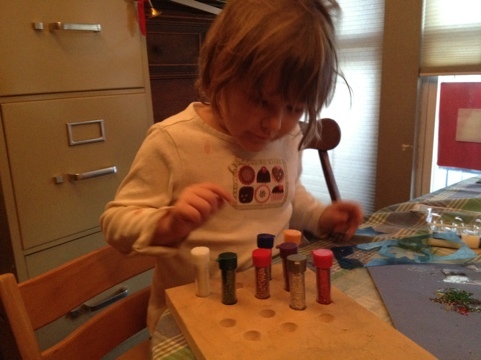 Lilyana got a bunch of glitter tubes yesterday. We drilled holes in a board so the tubes wouldn’t fall over, and on her own Lil started doing math problems. Took my blood pressure twice the other day: First time was a little high, before the second I brought the felt sense of my sleeping daughter to mind and my BP dropped 20 points. Lilyana (age 4): Daddy, when does Halley’s Comet come back? Lilyana: That’s a short period comet, it doesn’t come from the Oort Cloud! Practicing “vicarious yoga” these days: Watching my wife practice while I do the ironing. There are two kinds of people: those who feel criminal for leaving their sleeping child to go to work, and those who don’t get it. Parental Sign Language: The combination of sign language, charades, and mime used by parents so as not to wake a sleeping child. I'm a father of a vibrant and lively five-year old girl named Lilyana. I'm also a husband, data analyst, fan of Tableau, writer, and meditator. We do our best to fill up an old house in Saco, Maine with love, light, and laughter while welcoming our fear, worry, anger and grief. My data visualization blog is at Drawing with Numbers and my old massage therapy and somatic experiencing blog is at Trust Your Body. I can be reached a nowpapa@trustyourbody.net.